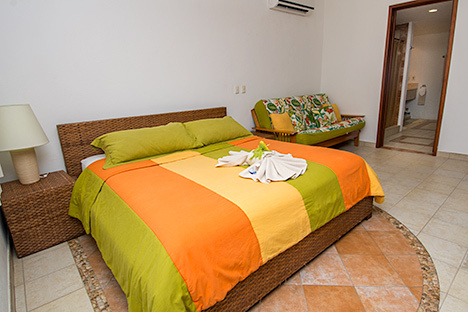 Residencias Reef #8380, a 1 BR, 1 bath Cozumel vacation rental condo, sleeps up to 4 (2 adults, 2 children) with one king bed and one double sleep sofa and is located on the third floor of Building #4. If you need to stay in contact with the real world, there is free high speed internet access so bring your own laptop, but no telephone. 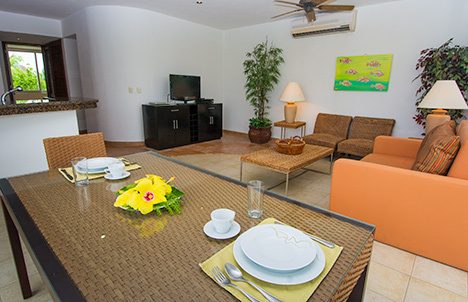 The living room and dining room are furnished with tropical wicker and rattan furniture. 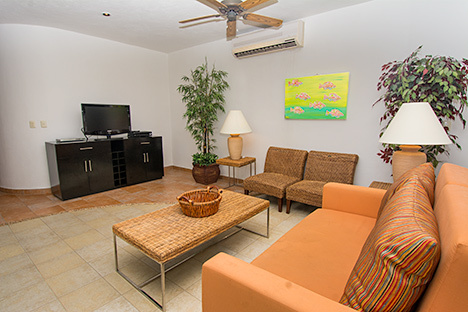 You'll want to spend most of your time on the beach or on the patio, but when you come inside, there is satellite TV with US programming and DVD/CD player. Bring your favorite DVDs or music or enjoy a full range of US channels. 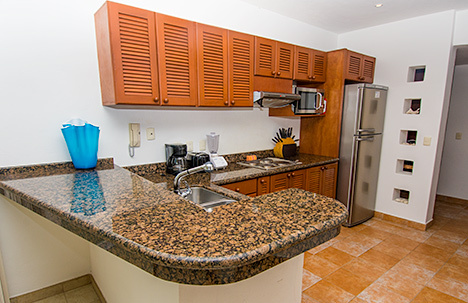 Of course the kitchen is fully equipped (but no oven) so you can do your own snacks or meals . . . or let us arrange cook service for you. Building 4 has a common rooftop solarium with 2 huge thatched palapas where you can escape the sun or gather for friendly conversation. It also has a wet bar complete with refrigerator, sink and outlets to plug in your blender to whip up some great cocktails for you and your guest. This area is lighted at night. 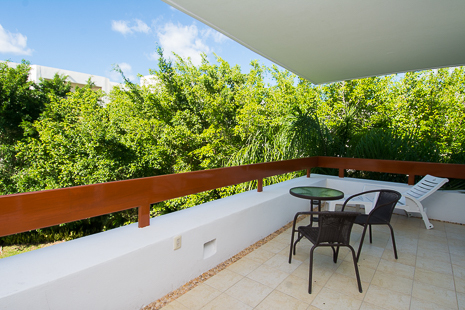 The solarium also has bathrooms and showers as well and a huge sun deck to get that great Mexican tan...... and don't forget that fantastic view... Come relax and enjoy! 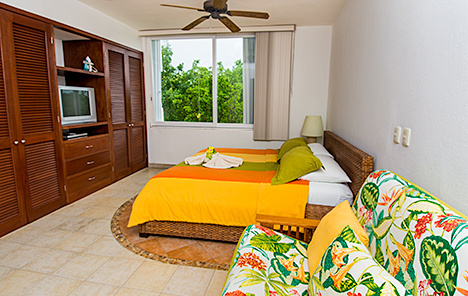 All the Residencias Reef condos have central air conditioning, maid service, and access to 2 large freshwater pools. 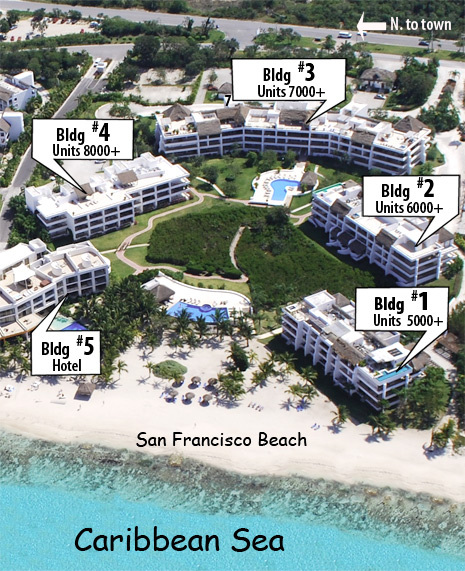 The condos are located about 9 miles south of Cozumel's only town, San Miguel... That beach stretches on for miles and miles so you can run or jog for as long and as far as you like. One king bed plus 1 double sleep sofa.